Sometimes there are people with whom we “just click” ... and there are those with whom we don’t. While it’s not possible that everyone will be your best friend – or even someone you want to invite to lunch – it is possible to understand people’s styles and appreciate the value they bring to the organization. 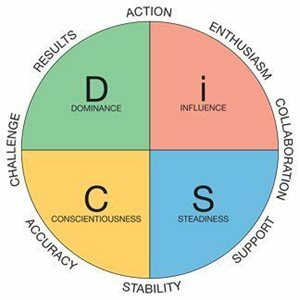 At HR Source, we use a tool called “DiSC” to address and describe different personality and communication styles. Here’s a quick summary of each of those styles. Do you recognize yourself or any of your co-workers? D = Dominance (or Direct): The D individual is one who tends to like power and authority and appreciates those who are direct, as they tend to be very direct themselves. They will make quick decisions and will push for results. A D is always up for a challenge and doesn’t like to waste time. Disorganization, inefficiency, lack of follow-through, and wasting their time will frustrate the D style – and they’ll let you know it! I = Influence: The I style loves to work in groups and in positive, motivating environments. When you describe someone as an outgoing “people person,” you’re probably talking about an I. They’re often the “life of the party” and want to be liked. This style brings optimism and enthusiasm to the workplace. Negativity and focus on minutiae will aggravate the I individual as will those who won’t collaborate or talk through an issue. S = Steadiness: Loyal, patient, consistent team players who don’t like being the center of attention describes the S style. This individual is always willing to help and is a great listener. They bring harmony and a calmness to the group, often wondering, “Why can’t we all just get along?” The S will often shy away from conflict and doesn’t like when others are insensitive, rude, or overly direct. Some people may tend to take advantage of the good nature of the S.
C = Conscientiousness: If you describe a coworker as detail-oriented, a rule follower, and someone who double (or triple) checks all of their work, they’re probably a high C. This individual thinks analytically, is very facts-driven, and likes clearly defined expectations and logic. Poor quality work, unnecessary risks, and pressure to make premature decisions will frustrate the C style. They also tend not to have a lot of patience for those who are overly emotional and may approach conflict indirectly. Of course, we all have some of each style, and we may have two dominant styles. Our goal should be to try to better understand ourselves and others so that we can appreciate each other and work better together. If you or other leaders in your organization would like to learn more about the DiSC profile and how to apply it to the workplace, HR Source is offering Communicating with DiSC on January 23, 2019. We can also help your managers or all your employees to better understand each other by bringing this session on-site, to your facility. For more information, contact us at 800-448-4584 or info@hrsource.org.